I used the Pampered Chef measuring bowl/pan to shape the base and a Christmas cake recipe. I used buttercream with a rectangular tip and after I sprinkled with aqua sanding sugar I kind of pushed it in so that each little square looks like an ice block. I used sugar cubes for the ice cubes and my local cake-decorating store provided the snowflakes and penguins. Thanks for looking! My husband’s sister and her husband share a birthday right before Christmas and I wanted to make them a cake that would fit with all the festivities but wasn’t "Christmas." They both had requested lots of icing! So this is what I came up with. I started with a standard Christmas cake recipe and pan. I then iced the cake in white butter cream (for some reason my camera gave it a yellow look but it was white. 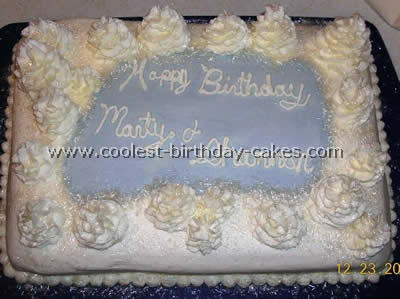 )I then spread some gray/blue icing in the middle and smoothed it out. I wasn’t too worried about the shape because it was a pond and it could be any shape. Then I used Wilton tip 4B to pipe the trees in solid icing. I sprinkled Wilton sprinkles (I forget what they were called, I already threw the package away but they looked like shinny pieces of plastic but were edible.) I paid special attention with the sprinkles to the edges of the pond to form a border and cover the transition from white to blue icing. I used four batches of the Wilton recipe with my special addition imitation butter flavoring. The cake was a hit and boy did it have a lot of icing. This was a cake I made 15 years ago in my last year at school. Everybody who saw it loved it so I thought some of you might like to have my Christmas cake recipe! I made a square fruit Christmas cake which I covered in almond paste. I then covered the sides in grey icing (quite roughly to create stone effect for bricks). Once this was dry I piped on some white icing to make the cement lines. 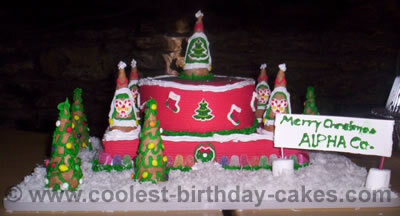 I then cut a large section of rolled white icing to make the snow covered roof and placed it on top of the cake. The chimney was a small square tin (or you could use anything you can find) for which I carried out the same process with the grey and white icing as I did with the cake. I made the toys, Santa and the sack out of icing (these could be done a few weeks in advance as they keep for ages in an airtight container). 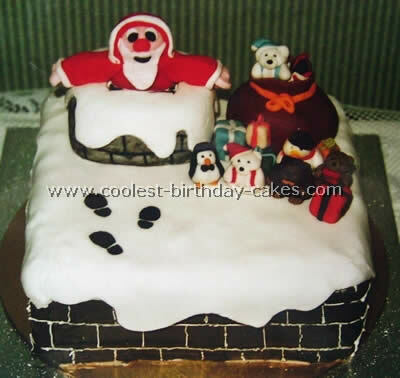 I then stuck them onto the cake along with the chimney and then painted on some footprints with black coloring. Even people I see nowadays from school still remember me for doing that cake! 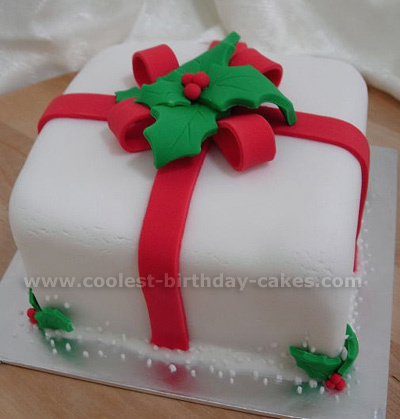 This is a regular 9×13 christmas cake recipe decorated with white butter cream frosting. The bottom border is very light blue. 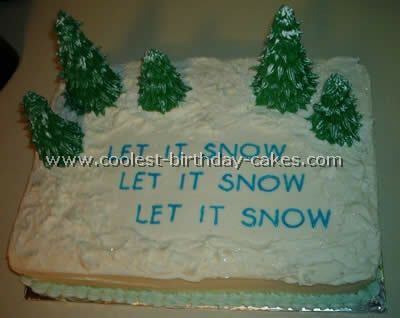 I frosted the top to look like snow but smoothed out the space to write "Let it Snow" with blue decorator icing. The trees are just sugar ice cream cones broken to different heights and covered with tip 16 pull outs. When the cake was all done I sprinkled edible white cake sparkles all over it. These are all fruit cakes covered with marzipan and fondant icing. 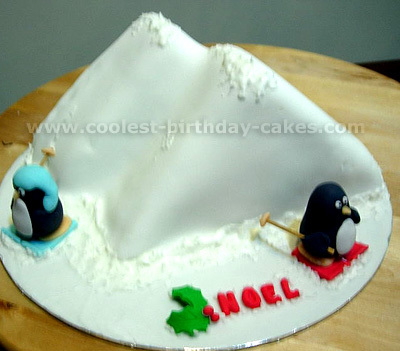 The fireplace is cut from an 8×8 inch square; the other half was made into a parcel, and two triangles of mountains for the penguins. These are ‘mini’ Christmas cakes for a fundraising bake sale event. I used this Christmas cake recipe to make a cake for the soldiers in my husbands unit this past Christmas. I got the idea off the internet (actually it was supposed to be a child’s birthday cake). It was supposed to be smaller but I scaled it up in size so that I could feed everyone. I added classic Christmas candy to give it a holiday feel. It was all chocolate. The trees were made from ice-cream cones as were the towers. The snow was coconut. After all the time and money put into it I could not get anyone to eat it. They just wanted to take pictures. I really had a good time with this Christmas cake recipe, though.